Um, what was that you said about Riverdale season 3? 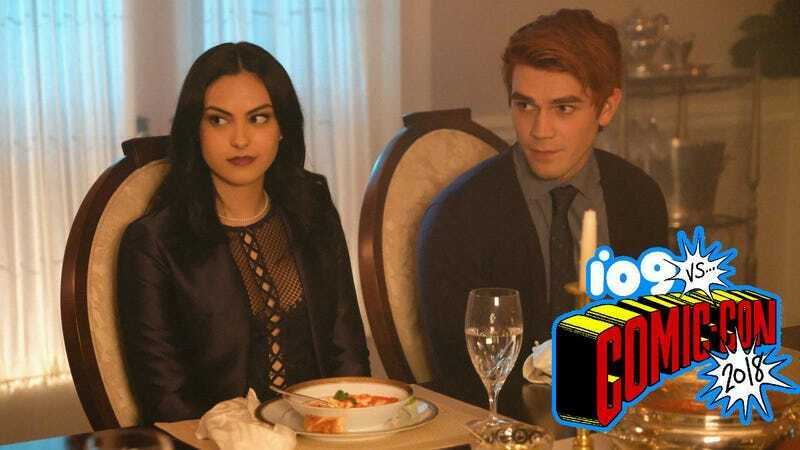 No matter what’s happening with Archie, Betty, Jughead, and Veronica, Riverdale loves a good mystery. So it’s fitting that, at San Diego Comic-Con, most of the cast was in the dark about what, exactly, season three of the show would entail. io9 was among the outlets who spoke to members of the Riverdale cast in San Diego last month, mere days after they finished filming the first episode of the third season. At that point, most of them were still unsure what season three would hold. They did, however, offer plenty of cryptic hints. Some of that will likely be because Jughead’s mom and sister, never before seen in the show, will be new additions this season. That should set up some problems with his gang, the Serpents, which just got a new member in Cheryl Blossom (Madelaine Petsch). However, Petsch doesn’t think that story will play out like audiences may expect. Cheryl Blossom is getting an unconventional family. One unit that may surprise fans this season is the parents. According to Casey Cott, who plays Kevin on the show, that older, other core group has a very interesting story. One of the members of that group, Fred Andrews, played by Luke Perry, warned fans about getting too excited about things to come. The Lodges are at a crossroads in season 3. While most of the actors are in the dark about what’s next, Sarah Schechter—one of the show’s executive producers—is not. She used the timing of season three to tease what comes next. Our characters are, shockingly, just entering junior year [and] I think that gives you a clue about the year. In American schools at least, junior year feels like the most important thing anyone has ever experienced when they’re in the middle of it. You’re thinking about colleges, you’re thinking about careers, am I going to stay in town, am I going to leave, what are my dreams for my life because becoming an adult feels, for the first time, like you can see it. So I think there is a lot about responsibility, and how you process [things]. Certainly our characters have gone though it in the first two years and will inevitably go through it again. “It” being purposefully vague, but watching how they react to that as they continue to come to terms with who they are, what they’ve done, what their families have done—what does it mean that Hal Cooper was the Black Hood?—all of that. Also, [we’re] not going to do the same thing. There’s not another masked killer in town. We constantly want to do things that feel new and different but as as rewarding as previous season. Riverdale season 3 starts in October.